CK Eternity Summer 2017 for Men is inspired by intense horizon colors in the desert at sunset. 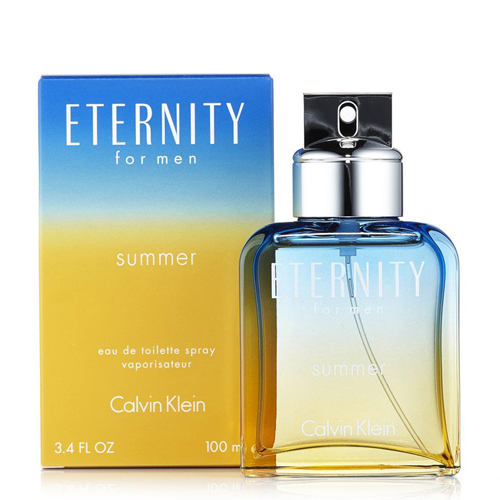 CK Eternity Summer 2017 for Men EDT 100ml. - Sensual - pure - exciting. This is a combination of the sensual and attractive warmth of the skin that is hot by the summer sun and the cool evening breeze. Jasmine and purple leaves are uplifting and refreshing. The heart of the fragrance delivers sensual depth and long-lasting with creamy and smooth essence of sandalwood. Eternity Summer Calvin Klein introduces herself in the interpretation of Eternity cult bottles with a summer feel inspired by intense horizon colors in the desert at sunset. Elegant bottles with gradual intensity of color shine with bright blue shades flowing into distinctive orange tones. Top notes: Sage, Bergamot and Ginger; medium notes: Jasmine, Coconut nectar and Violet leaf; basic notes: Vetiver, Sandal and Musk.